Nobody wants to admit how honestly lame they are at multitasking because they would have to admit to fudging on their job application (or lying during the interview process). Corporations require multitasking in their job postings to merit qualifications, and supervisors demand it in the workplace to substantiate productivity. The Catch-22 is that if multitasking is not perceived, the employee is criticized; and if multitasking is being attempted, the quality of the work is criticized. 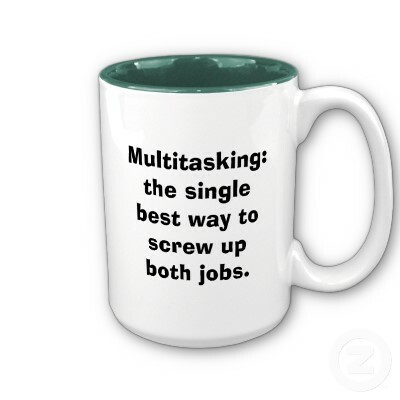 There is a reason for this: multitasking is a myth. David Meyer, a psychology professor at the University of Michigan, says, “There is scientific evidence that multitasking is extremely hard for somebody to do, and sometimes impossible.” Chronic high-stress multitasking is also linked to short-term memory loss. Most of the research has been applied to the debate over driving with cell phones or with people in demanding jobs such as air-traffic control, but it also affects quality of life for everyday tasks. Managing two mental tasks at once reduces the brainpower available for either task, according to a study published in the journal NeuroImage. “It doesn’t mean you can’t do several things at the same time,” says Dr. Just, co-director of Carnegie Mellon University’s Center for Cognitive Brain Imaging. “But we’re kidding ourselves if we think we can do so without cost.” If two tasks require the same parts of the brain, it is extremely difficult to succeed efficiently. As an example, listening for a child playing in the next room while talking to your boss on the phone creates conflicting auditory-processing demands. The human brain is biologically incapable of simultaneously processing attention-rich input. Studies show that a person who is interrupted takes 50 percent longer to accomplish a task and makes up to 50 percent more errors. People who drive while talking on cell phones miss more than 50 percent of the visual cues spotted by attentive drivers, and are involved in more traffic accidents than anyone except very drunk drivers. Schools and businesses praise multitasking, but it’s an irrational expectation. Multitasking reduces productivity and increases mistakes. Turn off your e-mail and social media sites and see what the results are. Hang up your phone and drive. And leave multitasking to computers. Great subject matter – loved this article. Great use of quotes and relative statistics – it really puts everything into sharp focus.